The oldest of 11 children, Moss was born on a Yadkin County tobacco farm and graduated from East Bend High School. He joined the Marine Corps Reserves at age 16 and later deployed to Korea. He was awarded the Korean Commemorative War Defense Medal in 2013. Moss owned and operated Lighting Creations Inc. for 44 years. In retirement, he has initiated and led a broad range of veteran advocacies and supported numerous community and civic causes. 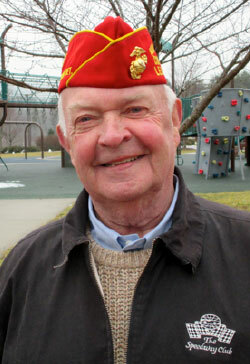 He founded the North Carolina War Memorial Foundation, which birthed the idea of the Carolina Field of Honor in Triad Park, one of the largest veterans memorials on the East Coast outside Washington, D.C. From 2009 until the CFOH was dedicated on Memorial Day 2014, Moss provided vision and leadership, while working tirelessly to raise funds. As founding Commandant and life member of Detachment 260 of the Marine Corps League, he remains active as an advisor and recruiter. He was the Marine Corps League’s top national recruiter in 2008 and 2010. His many honors include the Chapel of Four Chaplains Legion of Merit Award in 2006, induction into the Order of the Long Leaf Pine Society in 2014, and the Red Cross Salute to Heroes Award recipient in 2015.